Sorry, no TripAdvisor review is available. Age Restrictions: The Aggressor Fleet accepts guests as young as 10 years of age IF the minor is a certified diver, or a minimum of 16 years of age if not certified. All minors must be accompanied by a parent or guardian. 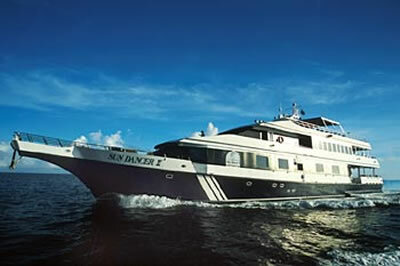 Price Includes: 7 nights on board the Belize Aggressor IV, all meals and beverages (including well brands of alcohol and Belikin beer), transfers from/to Belize International Airport, five and ½ days of diving up to five dives per day, other standard Aggressor Fleet services and amenities. My Personal Opinion: This is our favorite Liveaboard - because of the high quality accommodations, the friendliness of the staff, and the superb diving off Belize. Staterooms on the Belize Aggressor IV are naturally smaller than a hotel room, but spacious for a liveaboard. All are nicely appointed, and many feature picture windows. All staterooms have ensuite bathrooms, toiletries, hairdryers, flat screen TVs and DVD players, and individual air conditioning controls. Sheets are changed mid-week and towels are freshened daily. Morning beverage service is served to your stateroom, and nightly turndown service is provided in your stateroom with a mint on your pillow. Seriously? If you’re looking for other (non-dive) activites, then a Liveaboard is probably not for you. Just off Belize’s coast is the second largest barrier reef in the world. The reef offers pristine diving and the atolls beyond the reef are truly paradise. The marine life that inhabits the barrier reef is extraordinary and diverse…everything from schools of tarpon, turtles and stingrays to a wide variety of tropical species, and of course, the famed Blue Hole. The walls and drop-offs are spectacular. Turneffe Islands and Lighthouse Reef boast much of the best diving in Belize. On the Belize Aggressor IV, dives are prioritized for quality vs. quantity. Dive deck services include hanging up your wetsuit and rinsing your dive gear, handling your valuable camera equipment with care, and warm towels will be draped around your shoulders after your dive. In addition, hot chocolate (with or without alcohol) is passed around after each night dive. Dive safety is the highest priority, and the diving crew will give detailed dive briefings, check currents and temperatures before the dives and be in the water on every dive. Also, the crew monitors the vessel round the clock with a 24-hour watch schedule, and weekly safety drills assure that guests and crew are prepared in the unlikely event of an emergency. Enjoy a morning beverage delivered to your stateroom, and partake of delicious freshly prepared breakfasts and lunches served buffet style in the salon. Dinner is a fine dining experience with plated meals served to the table and a choice of entrees several nights per week. In addition, after-dive snacks are provided each day. The open bar includes locally available beer, wine and liquor.